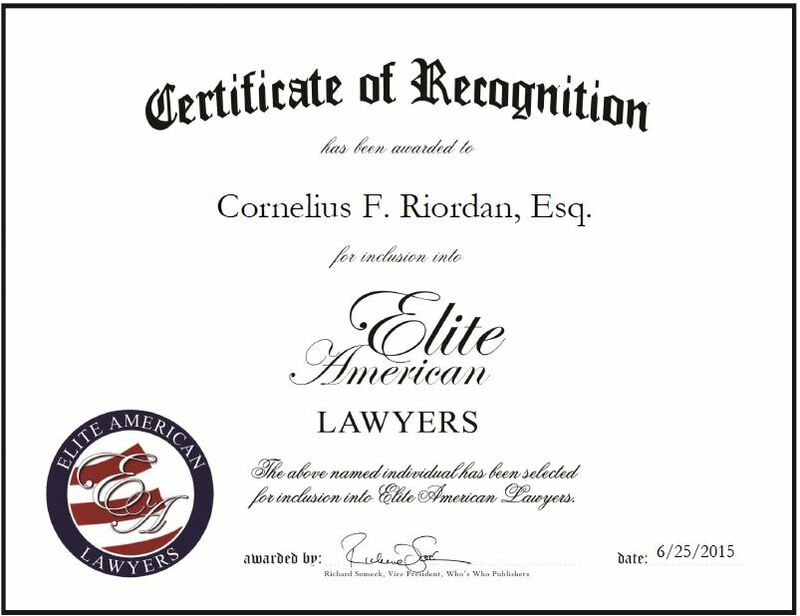 Chicago, IL, June 25, 2015, Cornelius F. Riordan, Esq. Owner and Partner of Riordan McKee & Piper, LLC, has been recognized by Elite American Lawyers for dedication, achievement and leadership in commercial litigation. Inspired to follow in his father’s footsteps, Mr. Riordan pursued a career in law. He has been a practicing attorney for nearly four decades and has headed up his firm, Riordan McKee & Piper, LLC for 18 years. Mr. Riordan’s commercial practice emphasizes both litigation and transactional aspects of fidelity, surety, construction, real estate and corporate law. Mr. Riordan is an AV Preeminent Attorney who has tried many cases to verdict in the fidelity, surety and general liability fields. He spends his days overseeing operations, interacting with clients, reviewing files, drafting agreements, litigating, handling depositions, and representing clients in the litigation and transactional aspects of construction and surety law. Mr. Riordan takes great pride in his work and has gained a stellar reputation for his commitment and dedication. He has been named to Illinois Superlawyers since 2008 in Construction Litigation, and his firm was named a Tier 1 Law Firm in Construction. Mr. Riordan believes he has been able to excel in the field of law because he is passionate about his work and clients. Moving forward, Mr. Riordan would like to continue offering top-notch legal services to clients across Illinois. Contact Cornelius F. Riordan, Esq. This entry was posted in Commercial Litigation and tagged AV Preeminent Attorney, construction, corporate law., fidelity, liability, real estate, surety. Bookmark the permalink.